OpenOffice instructor and office suite expert Solveig Haugland walks your through modifying forms and viewing Microsoft Office track changes in OpenOffice 2.0. Confused about modifying forms? Worried about editing Microsoft Office documents with OpenOffice 2.0? Never fear, OpenOffice.org instructor and OpenOffice.org 2.x Resource Kit co-author Solveig Haugland offers workarounds to remedy these issues. 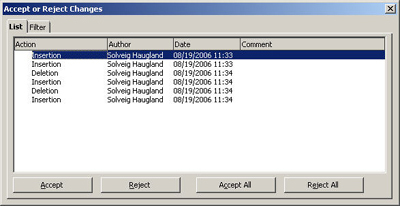 In this tip, Haugland helps users deal with databases one form at a time and describes two separate methods for creating data lists using secondary tables. Click here to get more OpenOffice tutorials. Choose Edit > Changes > Show. You should then see all the changes that have been made. You can accept or reject changes by choose Edit > Changes > Accept or Reject, and you'll see a list of all the edits. Double-click each and it will be highlighted in the document. Use the buttons in the window to accept or reject the changes. The key question isn't so much about the form; it's about the database that the form is based on. If you create the database through OpenOffice.org you will be forced to create a key, so that's not a problem. To modify a form, just open the database that it's based on, then click the Forms icon at the left side, and when you see the form name, right-click on it and choose Edit. The form will open. 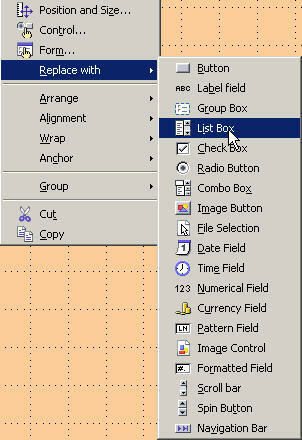 Right-click on any component and choose Control or Form to modify it. You can also use the Form Controls toolbar. Choose View > Toolbars > Form Controls, when you have the form open, if you don't see the toolbar. I'm not enough of a database expert to do the table relations planning. However, you could set up a view between the two tables, the main and the secondary. See my article on views. 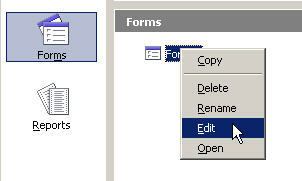 Then, modify the form and choose to replace the desired field with a list box. Right-click on the control and in the Data tab, specify the field to bring in the data from. You could also just create a field with the desired fields in them. Create a list field using the Form Controls toolbar, and don't connect it to a table. Just right-click on it and choose Control. Then, in the window that appears, look for the List Entries field and just type your entries. See my article on modifying forms; there's a lot of detail in there about creating a hardcoded list field. Solveig Haugland has worked as an instructor, course developer, author and technical writer in the high-tech industry for 15 years, for employers including Microsoft Great Plains, Sun Microsystems and BEA. Currently, Solveig is a StarOffice and OpenOffice.org instructor, author, and freelance technical writer. She is also co-author, with Floyd Jones, of three books: Staroffice 5.2 Companion, Staroffice 6.0 Office Suite Companion, and OpenOffice.org 2.x Resource Kit and OpenOffice.Org 1.0 Resource Kit, published by Prentice Hall PTR. For more tips on working in OpenOffice, visit Solveig's OpenOffice blog.